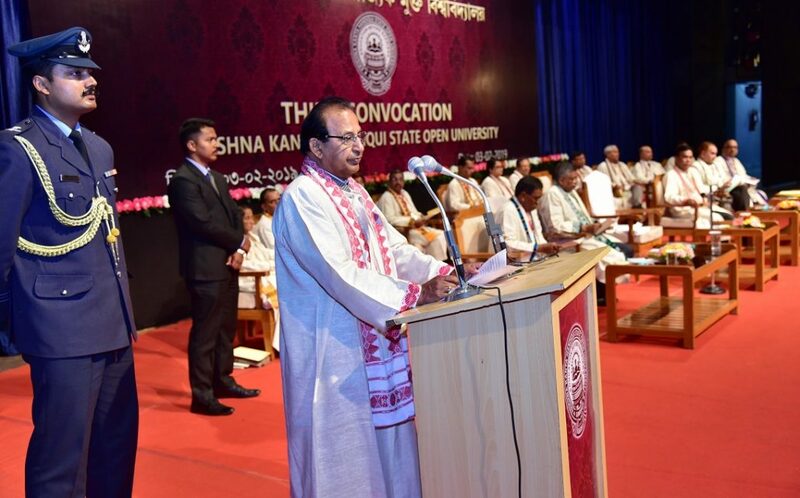 Assam Governor Prof Jagdish Mukhi who is also the chancellor of Krishna Kanta Handiqui State Open University (KKHSOU), conferred honorary D Lit on Prof Nageshwar Rao, vice chancellor of Indira Gandhi National Open University in Guwahati on Sunday. 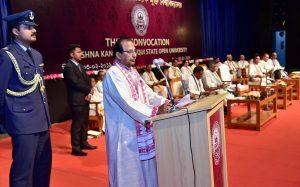 The Governor also conferred honorary Ph Ds on Prafulla Govinda Baruah, editor of The Assam Tribune, Prof Tabu Ram Taid, eminent educationist and internationally acclaimed filmmaker Rima Das along with conferring degrees to 10,330 graduates, 1754 masters and 5 Ph Ds at the third Convocation of Krishna Kanta Handiqui State Open University held at Srimanta Sankardeva International auditorium in Srimanta Sankardeva Kalakshetra in Guwahati. Prof Mukhi while speaking on the occasion said that open universities are boon to several students who are otherwise deprived of the fruits of formal education. “Open universities provide an alternative choice to those students who cannot afford higher education at the formal set up because of some limitations. So distance education comes as a blessing for such students. Also, the fee structure for distance education is affordable than that of a regular on-campus degree,” Prof Mukhi said. Further, he said that it is a myth that students with lesser grades opt for distance learning, because instances are aplenty to show meritorious students also opt for distance courses, Prof Mukhi added. As an open and distance learning institute, Krishna Kanta Handiqui State Open University is well supported by other conventional learning modes of open and distance education such as face-to-face counseling, use of self-learning materials etc which have made the university a popular name in the landscape on distance learning in the State. Besides, the university also utilizes an ICT based learning tools like radio-counseling, phone-in programmes, audio visual aids etc which have also proved to be boon for spreading quality higher education in the State, the Governor said. He further added that to suit the learning needs of the 21st century, the University has developed easily accessible modes of quality higher education and training with the use of latest educational inputs and technology. 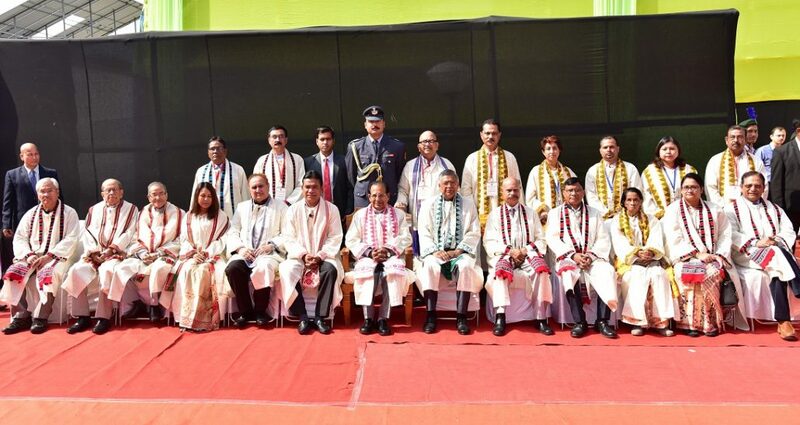 The Governor also lauded the university for launching the ‘Jnan Taranga’ – the first community radio service of the Northeast in 2009; to provide education free of cost to the jail inmates as well as the differently able learners of the society. Prof Mukhi also took note of ‘Mother Teresa Social Welfare Mission’ under which the University has adopted backward tribal villages of the Rani Block, presenting Krishna Kanta Handiqui National Award and Krishna Kanta Handiqui National Fellowship and scholarship to female UPSC candidates for successfully clearing the Civil Services (Preliminary) examinations conducted by UPSC. The Governor congratulated all the graduates, recipients of honorary degrees, and others for their attainments and said that the importance of this occasion does not simply lie on receiving degrees dressed with ceremonial robes but in the commitment to continue on the path of discovery of meaningful knowledge and development of the mind and provide selfless service to the society.